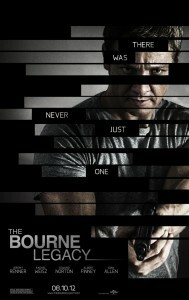 Enjoyed the Bourne Legacy tonight. The Bourne Ultimatum pulled a high wire act with the clever play with time and the ending of the Bourne Supremacy. The Bourne Legacy opens quite slow with a lot of work being put into establishing new characters and how they fit into the existing timeline. If action is you’re thing though don’t worry when the fuel is poured onto the fire it really goes up with a big bang. Where the first three films have shown us the mechanisms of Treadstone and Blackfriar from Jason Bourne’s outsider viewpoint the Bourne Legacy gives us a view from characters who are a bit more on the inside although they are tools rather than the puppet master at the conspiracies heart. Aaron Cross is not a simple Jason Bourne retooling because an actor was unwilling or unavailable to appear. He has his own, different flaws, drives and personality – he is more than just Bourne 2.0. All the familiar Bourne styling is all over the film. There is a watery reveal of the hero. Occasional flashbacks. The grainy, documentary look. The steady cam is a little steadier this time until Cross is hurt which emphasises how Cross is more in control than the earlier model. I love the way it plays with the music – it’s in the same vein to the first three but uses new themes and eventually finds its way to a new version of Extreme Ways at the end. Some people may find the ending a bit abrupt but I thought that like the Bourne Identity it gave you just enough ending without leaving a lot of baggage for the next film.